I took pictures of a new pair of socks yesterday but for some reason they won’t upload to my computer. I have always connected my camera with a USB cable but now it’s suddenly not working. I have no idea why this is happening but all the experts say to get a card reader and I’ll be doing that later today. Keep your fingers crossed that this solves my problem. 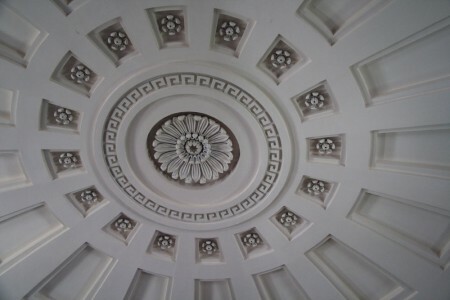 In the meantime, here’s a pretty picture of the ceiling at the Unitarian Church where the Presidents Adams are buried. I’ll be stepping away from the technology now. What a beautiful ceiling. Bummer about your technology malfunction. Fingers crossed. Yeah, I’m constantly calling for mr e to fix this or that, or come make this work. How frustrating! Hope the card reader does the trick. Our computer and cameras (both of them) suddenly stopped talking via the USB. In our case, uninstalling and reinstalling the driver worked to fix the problem. Good luck with whatever your particular problem is. I love the ceiling. I went and ordered a bunch of books about Abigail Adams. I liked the part in one of her letters where she told John it was a pity men didn’t like to knit or do needlework – it was very soothing. And here I sit with 6 USB cables right under my feet! Lovely ceiling pic though! That is really frustrating (especially after the photography class I bet!) but the same thing happened to me a few years ago, and a $30 card reader from Radio Shack did indeed solve problem. Craftsmanship like that is extremely rare anymore (referring to the ceiling). Good luck to you and your technology today! I’ve been spoiled with card readers built in to all of my most recent (HP) computers and even my latest printer, but was flummoxed when I bought an older camera that is using Compact Flash card that is, apparently, becoming obsolete and the built-in readers don’t have a CF slot. I bought a $15 card reader from Office Max a couple of weeks ago and LOVE it — so FAST, for one thing, and teeny, too! Oh no. The ceiling is lovely but the tech issues definitely are not. I love that my laptop has what I guessis a built in card reader. So much easier. The USB cord connection is a bit less reliable. Doesn’t your laptop have a card reader built into it?? I suspect it does. Crud! Technology is great, when it works… pretty ceiling! Excuse me, I have to go play with my 25 year old daughter’s American Girl doll who was inexplicably unearthed from the closet yesterday. Uh-oh — Samantha’s arm came off. If a crochet hook repair doesn’t work, it’s off to the doll hospital for Samantha. Sometimes low tech solutions are just the ticket. This is off topic, I know! I’m with Norma (in the knowing “nuthin’ about nuthin’ ” technology department)- perhaps it is (as an astrologer friend of mine would say) the fault of “Mercury Retrograde” ??? I would start with Elizabeth’s recommendation of uninstalling and re-installing the drivers. I’d also check the camera manufacturer’s website to see if you need to update anything. That said, I love my little card reader. DD says they have the multiplex card reader at school, the kind that will read micro cards, CF, and the bigger ones used in our SLR’s. newegg.com tends to have interesting reviews — I’ve learned a lot about why a person would want to buy one product instead of another. I hate when technology isn’t doing what it’s supposed to do. We’ve got our fax machine on the fritz… rings, won’t answer. Grrrr. Hope your tech issues clear up soon. I’ve used a card reader since the USB on my first camera died several years ago…I love mine. Oh, those UU churches in the NE – such gorgeous architecture! I vote new cable, but I only know enough to be dangerous. Ack! I hope you are able to find the right solution, and quickly. I guess I’m spoiled with my built in card reader… ;op I hope you figured it out!